Getting your dog to give a little bark on cue is a fun trick to teach and show off. Persistent barking during the day is something to be discouraged, but controlled barking as a command can be a better way to discipline this particular behaviour, especially if your dog is particularly vocal. Start by calling your dog over and get him interested in the treat in your hand. Keep talking to your dog in a high pitch and excited voice to raise the excitement of the dog and use the word ‘Speak’ several times in your sentences. When the dog produces noise, whether it be a full bark or a whine, reward. Keep using the word ‘Speak!’ in an excited voice until the dog keeps vocalizing each time. 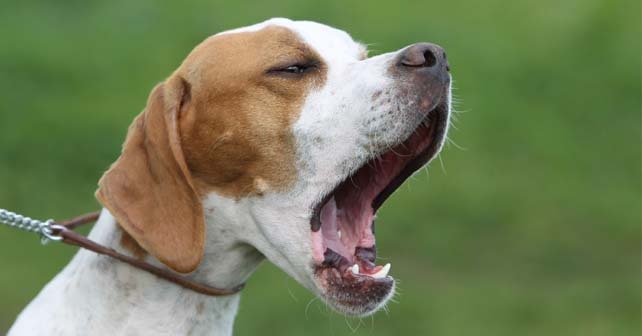 Even if you can get a small whine, withholding rewarding for just a moment longer might make your dog’s vocals louder. When your dog produces a single bark, after many practice sessions, you will have mastered the command.